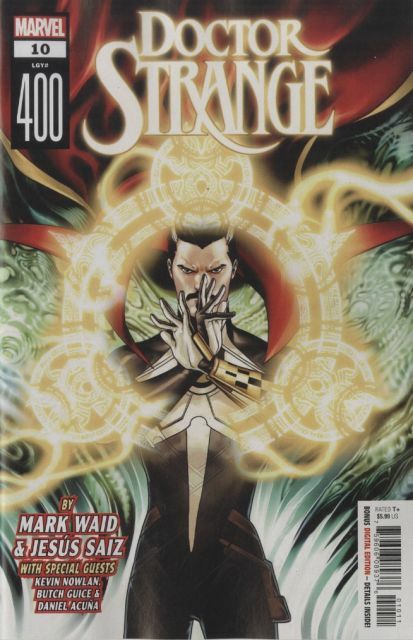 DOCTOR STRANGE HITS HIS MILESTONE 400TH ISSUE! Creative team Mark Waid and Jesus Saiz are joined by some of the best DOCTOR STRANGE artists of all time to tell a monumentally strange tale! Someone has been working in the background since the first issue, chipping away at Doctor Strange and other magicians, undercutting and depleting their magic, and the other shoe finally drops. Does Strange stand a chance against someone who can take his magic away with the snap of their fingers?